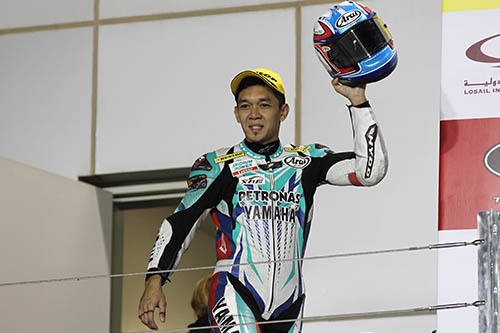 SUPERSPORTS 600CC Mohd Zamri Baba concluded what has been a dramatic year in the 2013 PETRONAS Asia Road Racing Championship on a high note as the PETRONAS Hong Leong Yamaha rider earned another podium and a top five finish to secure third overall in the SuperSports 600cc category. In Race 1, the 30-year old finished third in a grueling five way battle against Katsuaki Fujiwara, Broc Parkes, Yudhistira and M.Fadli. Zamri was hoping to use his front row start to trail championship leader, Azlan Shah Kamaruzaman and fight for victory but the latter proved exceptionally fast as he was able to pull away from the pack as soon as the third lap. In the end, Zamri had to be content coming in third with 32’28.584s. Azlan went on to win the race with 32’20.579s while Fujiwara crossed the finish line second with 32’28.543s. A similar formation took place in Race 2 with Azlan is now in the picture and the pace much faster as the race was shortened to 13-laps after Mohd Farid Badrul crashed out of the warm-up lap. Perhaps one of the most fiercest battle this season, all four riders swapped positions numerous times in the first half of the race before Azlan managed to get the better of his rivals and create a slight gap ultimately completing the race with 27’56.248s and secure the SuperSports 600cc title with 228 points. Completing the podium steps were Parkes and Fujiwara with 27’56.428s and 27’59.440s while Zamri settled in fourth place with a total time of 27’59.498s. Picking up 27 points, Zamri claims third place in the overall standings with 149.5 points. Separately, Ahmad Afif Amran claimed runner-up position in the Underbone 115cc category after title rival, Hadi Wijaya managed to secure the championship crown by coming in third in Race 1. Representing PETRONAS Hong Leong Yamaha, Afif completed Race 1 seventh and improved by three positions in Race 2. He timed 19’15.935s and 19’11.621s respectively. Mohd Affendi Rosli took Race 1’s chequered flag with 19’15.810s followed by Thailand’s Vorapong Malahuan with 19’15.885s and Hadi Wijaya third, 19’15.910s. Hadi Wijaya rounded off the season in ominous fashion as he secured victory in Race 2 with 19’11.578s followed by Mohd Amirul Ariff Musa second with 19’11.584s and Kazuki Masaki third, 19’11.618s.